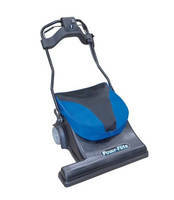 Powr-Flite’s PF28SV is the perfect sweeper/vacuum for use on multiple floor types. This powerhouse is CRI Certified Silver and picks up larger debris that often clogs traditional vacuum cleaners. This system has a large 3/4 bushel recovery bag and 60' cord to minimize downtime. Its wide 28" cleaning path improves worker productivity providing nearly three times the productivity of traditional upright vacuums. With 5 levels of height adjustment, the PF28SV quickly transitions to different cleaning surfaces, ensuring that dirt and debris are removed regardless of carpet height. Tow-Behind Magnetic Sweeper features 3-in-1 design. Road Sweepers clean up ferrous materials. Floor Sweeper features Quadra brush system. Diesel-Powered Sweeper expands functionality via feature set. SuperVac Vortex Sweeper comes with Isuzu NPR Gas chassis.